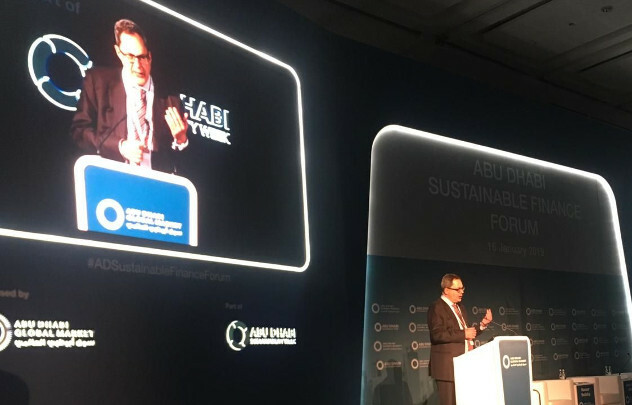 ADGM Academy’s School of Sustainable Finance is delighted to announce the launch of a new education and communication initiative at last week’s Abu Dhabi Sustainable Finance Forum (ADSFF), sponsored by ADGM. ADSFF, which took place on Wednesday 16 January, was opened by HE Eng Ibrahim Al-Omar, Governor of the Saudi Arabian General Investment Authority and included speeches from HE Ahmed Al Sayegh, Chairman of Abu Dhabi Global Market together with senior government ministers and chief executives. A focal point of the event was the signing of the Abu Dhabi Sustainable Finance Declaration by 25 key UAE public and private entities in the presence of HH Sheikh Hamed bin Zayed Al Nahyan, Chairman of Crown Prince Court. The Declaration will help the United Arab Emirates to foster positive economic, social and environmental outcomes and to advocate sustainable finance and investments. These actions will support the long-term well-being and growth of the UAE economy whilst maintaining a sustainable approach to development. ADGM Academy partner, The London Institute of Banking & Finance is working with ADGM and ADGM Academy to support the third pillar of ADGM’s initiative, ‘Fostering Communication, Knowledge and Awareness.’ The area of sustainable finance is still in its youth and the programmes that the Academy runs with the Institute run will help, in part, to shape best practice in this area. Alex Fraser, Chief Executive of the Institute, was asked to close the morning’s discussions by outlining the Institute’s delivery of the education and communication strategy. Mr Fraser’s speech included an announcement that the Institute will launch a series of educational programmes, from Foundation to Advanced levels, to help different groups understand how sustainability will shape their roles and responsibilities through a mixture of theory and practice. At Advanced level the Academy, through the Institute, will offer a Global Executive Masters in Sustainable Finance, the first of its kind anywhere in the world. The programmes will cover governance, policy and regulation; accounting and disclosure; energy and sustainable development; investment; risk and strategy. The Institute has also committed to create a new Learning Centre which will run alongside the formal programmes delivered by the Academy’s School of Sustainable Finance. This will be a unique resource for practitioners from the region to access learning resources. The new Centre will contribute to debates and forums and provide peer-to-peer engagement opportunities. It will publish research into the topic, collaborate on projects with other academic bodies and sponsor awards and other recognition schemes. The main sustainability conference and exhibition were impressive, showcasing some extraordinary environmental projects and organisations, from eco-friendly communities to revolutionary energy projects. ADGM and ADGM Academy shared a booth which welcomed a number of senior figures from the MENA region from both government and the private sector.